I am Flapper the Sous Chef. I am making Flapper's Liver Chips FLAPS-jack! I am very happy (and proud) to announce that I, Flapper Choo, finally have a food named after me - "Liver Chips FLAPS-jack". As part of this Sony's "Prove Yourself"campaign, mummy has made 9 promises to me for my 9th birthday? Mummy calls it, "9 promises to Flapper". I am not revealing what all the 9 promises are. You will have to wait till the end of the campaign to find out! I approached my wonderful (and spoiling) sponsor, The Barkery Singapore / Balto Pets if they could help fulfil this promise. 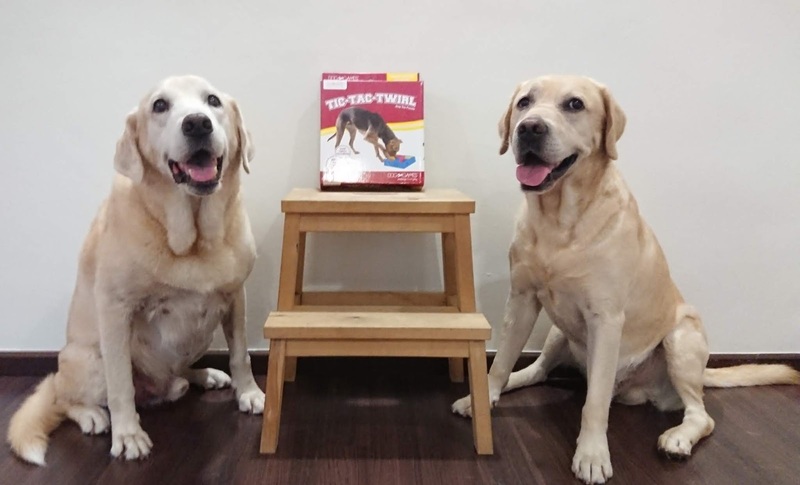 Frodo is the current face of The Barkery Singapore. 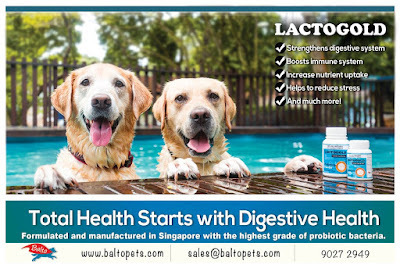 Frodo and I are the faces for Lactogold Probiotics? Read our review of Lactogold Probiotics here. Asked for permission if I could invade their kitchen for a day to be a Sous Chef. To create a new food/cake using my favourite ingredients - LIVER and MILK - and asked if they could name it after me. I mean how hard can using liver and cow's milk be... right? I had my sparkly eyes set on a pup-cake. But they brought up a valid concern. What if other dogs are lactose intolerant (of course we had to consider that Flapper's food will become a sellable item!) and using goat's milk will be very costly for consumers. Okay. Valid point... but well, Lactose intolerant? What's that? We, the Choo dogs, have been well-trained to have a strong stomach with good resistance. We will happily slurp up all the cow's milk in the world. No problem! "Auntie Margaret (Head Chef) has been quietly working on a recipe and she has come up... "Liver Chips FLAPS-jack". Liver Chips FLAPS-jack is perfect. First, pancake is not on Barkery's menu (something new!). Third, FLAPS-jack.... could not get any more perfect than that! 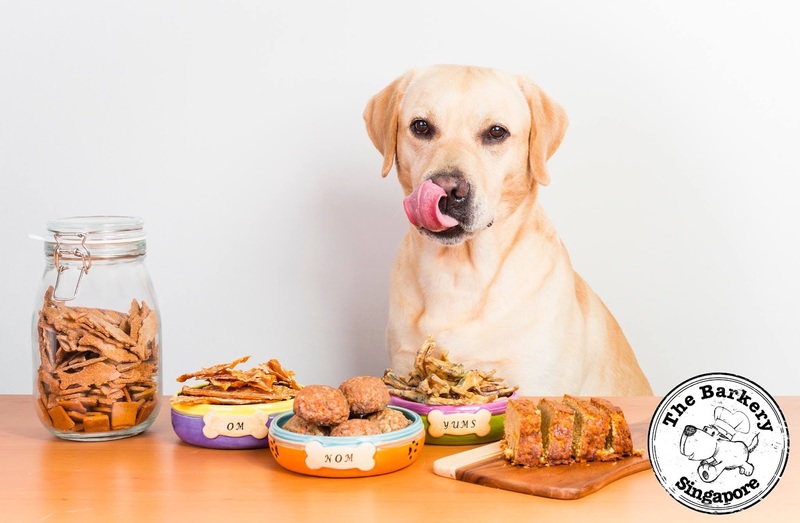 And knowing Barkery's ethics, it will all be made of nothing but fresh and human-grade ingredients - always fit for humans to eat. I knew that whatever this FLAPS-jack is... it will be super yummilicious and made of quality ingredients. I am going to have my very own Liver Chips FLAPS-jack and I will be a Sous Chef! Woohoo! "How to make Flapper's Liver Chips FLAPS-jack"
I would give it 6 out of 5 paws! Flapper, being an influencer for Sony's Action Cam, I wanted to showcase a variety of activities that could boast the image quality and capability of the camera. I also wanted each of Flapper's video to tell a story rather than random senseless shots just to show off the camera's capability. Now you know why there are 'short' and 'full' videos for each adventure. For this activity, I once again utilised two Action Cams - one mounted on a tripod (which I occasionally went hand-held as well) and the other on Flapper with his make-shift collar mount. At this point of filming, I knew the battery life of the Action Cam was not going to be an issue. By now, I am confident it will last me for a good two hours. But being forgetful me, I did forget to charge up both cameras! 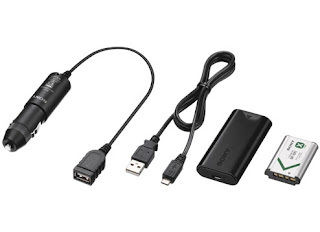 Fortunately, one good investment I made was to purchase the travel battery kit for my "just in case" moments especially since I cannot 'plug Flapper' to a power point while filming. So this extra battery came in very useful. After all, we are featuring Flapper's favourit-est ingredients and it would be fun to see his POV! I was hoping to capture some drools but that did not happen. Flapper must have known he was on camera and repaired his faulty faucet. Auntie Margaret was nervous prior to the filming and was camera-shy. So I said it was fine to crop her face out. We could make the video like those animations where the human's face is never shown. Then as we progressed, she relaxed and started having conversations with Flapper. I stooped down to avoid getting caught by Flapper's camera but I could watch what was happening with the Live View Remote. I was godsmacked by what Flapper's POV was capturing and I whispered to Ann Marie and Auntie Elizabeth, "we have to convince Auntie Margaret to show her face. These footages are too good not to show. I could not wait to see the footages when I got home. This was the first time Uncle Nic could not join us so it was me, me, me and Flapper to film. I was nervous whether the footages taken would be good enough. But as I was going through the footages, I was caught by surprise. Pleasant surprise. Flapper's natural but greedy responses throughout the cook-out. The heartwarming Auntie Margaret and Flapper moments - from the former's early nervousness to her relaxed personal conversations to Flapper as the filming progressed. Some of Flapper's subtle and not-so-subtle response to Auntie Margaret's conversation - I missed that whilst filming. At that point I knew, I was in "trouble". It was going to be tough editing down this video. Believe it or not, this little cook-out adventure actually took the longest time to edit of all the videos thus far. It was a struggle letting go of some footages. As much as editing can be [very] tedious, it never ceases to amaze me what gets caught on camera - many moments that I would have otherwise missed because my focus is on Flapper. I have to confess that I have always wanted to do one of these Sous Chef videos with Flapper but did not have a compelling reason to... till now. This turned out to be a super fun activity and of course Mr Flapper did not complain. He got to wolf down the Liver Chips FLAPS-jack - layer by layer. 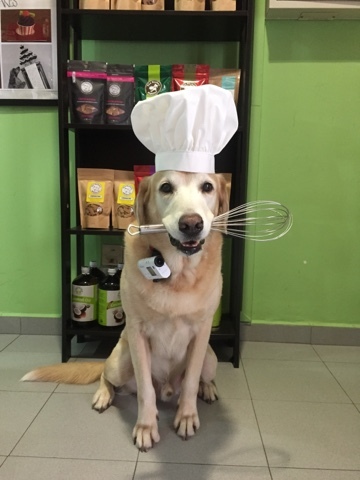 I am so grateful that Barkery spontaneously agreed to participate, created this new recipe and opened up their kitchen for us to film. And as always, I continue to count my blessings at the end of each adventure that Sony Singapore chose Flapper to be an influencer for the Action Cam.